Leading Manufacturer of fine pole rectangular electromagnetic chucks, rectangular electromagnetic chucks, concentric pole round electromagnetic chucks, rectangular magnetic chucks, magnetic grinding chuck and fine pole rectangular permanent magnetic chucks from Hyderabad. Our organization plays an important role in offering Fine Pole Rectangular Electromagnetic Chucks to our customers. Fine Pole Rectangular Electromagnetic Chucks has got powerful magnets which play an important role in creation of powerful magnetic field. Offered range is available in various customized options. 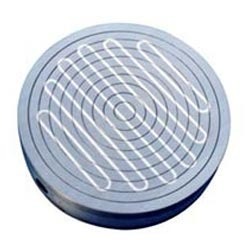 These products are widely popular and highly useful in various industrial applications. Provided product is considered to be highly functional as well. These Electro Magnetic Chuck are suited for a wide range of work pieces. For grinding application of small to big size components. Since it produces stale attractive force in the lengthwise direction, it is possible to move the work piece along the belt while maintaining the attractive force. The plate design makes it easy to design and locate fixtures correctly for effective holding of intricately shaped work pieces. The operating voltage is 110 VDC up to 12103.18, beyond that 220 VDC. Electro Magnetic Chuck can be designed for other operating voltages. Long pole Electro Magnetic Chucks are also made, the ordering series for the same is 12104. 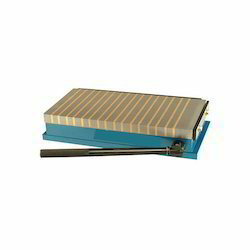 Electro Magnetic Chuck with all metal brass and steel laminated top plate. High resistance to coolant/ corrosion. Electro Magnetic Chuck has high mechanical rigidity and proven robustness. Electro Magnetic Chuck is guaranteed water proof. 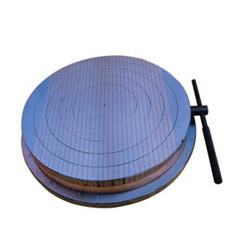 Electro Magnetic Chucks have a multi energized magnetic circuit, consisting of a number of adjacent, reversed coils making up a magnetizing core which is small pole pitch. The multitude of exciting windings increases dissipation of electrical energy which becomes magnetic energy, while limiting both temperature rise caused by Joule effect and distortion of the chuck. 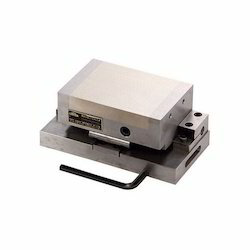 Top plate of Electro Magnetic Chuck is machinable up to 8 mm. Electro Magnetic Chuck can be easily fitted to the surface grinder. Our company has achieved laurels for providing Rectangular Electromagnetic Chucks to the clients. These products are manufactured under the stern direction of our experts by utilizing premium quality material with the assistance of pioneering technology. Rectangular Electromagnetic Chucks are mostly utilized as a work holding device for surface grinding machines. Offered range is highly suitable for all types of surface grinding operations on various applications. No electricity required to keep the Electro Permanent Magnetic Chuck ON. 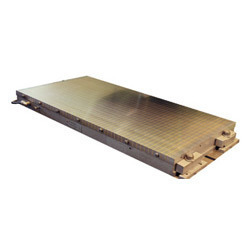 All Metal Top Plate of Brass and Steel lamination provides full active magnetic area. Variable power makes it possible to adjust the magnetic force. EPM Chuck drastically reduces the loading, unloading the work pieces. 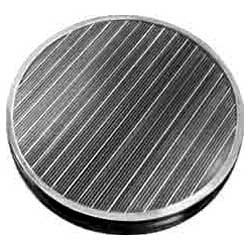 Electro Permanent Magnetic Chuck can be easily fitted to the surface grinder. Electro Permanent Magnetic Chucks are suitable for horizontal spindle surface grinding machines as the main cutting thrust is towards the length of the chuck, poles at right angle of the wheel give more gripping of the job. No heat build up or deformation provides high precision accuracy. These Electro Permanent Magnetic Chucks are also available in long pole design and the ordering code for the same is 13106. 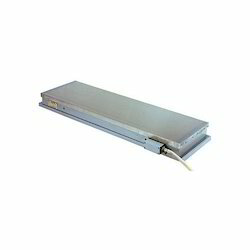 Large area can be arranged by multiple mounting of EPM chucks side by side which can be operated by a single controller. 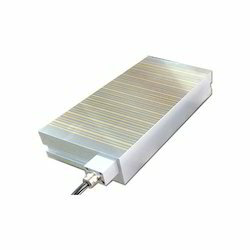 Special purpose EPM chucks can also be designed to suit particular applications. Pole pitch of 2mm (1.5 0.5) can be made at extra cost. Our company has achieved milestone for providing Concentric Pole Round Electromagnetic Chucks to the clients. These products are offered in both, standard as well as customized specifications as per the requirements of esteemed clients. Concentric Pole Round Electromagnetic Chucks are made at the well-equipped manufacturing unit under the supervision of highly experienced professionals using tested quality raw material and latest technology as per set industrial norms. All metal aluminium and steel set top plate. Made from solid plate, top plate integral part of the chuck such has high mechanical rigidity and proven robustness. Watertight execution, allows abundant application of coolants. It can be mounted on Machine table by fitting the adaptor plate to the threaded holes in the back side. Also lathe operations for disc components. It is particularly efficient for holding relatively thick, medium and large size work pieces and especially discs. Carbon Brush Holder with Brass collector slip rings for fitting on the machine spindle for Power supply. The operating voltage is 110 VDC up to 12201.11, beyond that 220 VDC. Brass separated chuck can be made at extra cost. Most suitable for EDM, Wire cut and similar applications. 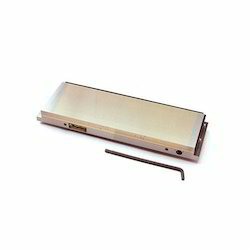 Enables grinding of thin and small work pieces that hitherto presented problems in holding. 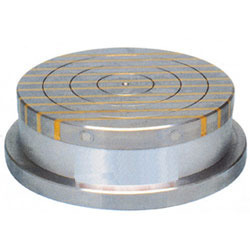 Stable magnet grid movement provides highest precision grinding. 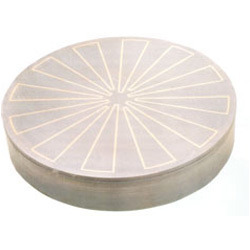 Steel and brass laminated top plate. Extremely low height for better job accommodation. Made with super powerful NdFeB, new generation magnets. Variable power is obtained by varying rotation of handle. Unique design of the chuck minimizes the movement of top plate when switched on, resulting in better job accuracy. PMC Ideal for grinding of hardened jobs. Powerful and most suitable for medium and large components for grinding, light milling and shaping operations. 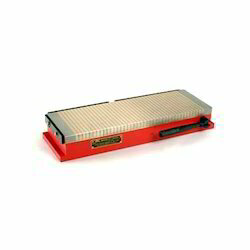 Useful for grinding and drilling with laminated transfer blocks. Accurate and stable working face. Fully extended pole with minimum loss of working area. Made with high power permanent magnets. Provides powerful holding for thin and thick work pieces. Suitable for grinding, light to medium milling and shaping operations. Adaptable to wide range of work pieces. Double magnet system for maximum power. 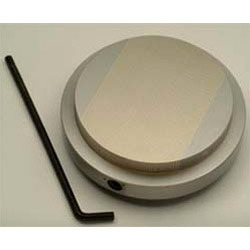 Use of ferrite magnets ensures that the magnetic force will not reduce even on long use. Low magnetic field: no magnetization of tools. Smooth and simple actuating mechanism. Flat type for wide ranges of uses. Sine table with other style of chuck is also made. Large effective area is provided for machining the work pieces. Constructed of hardened alloy tool steel. Low height for more wheel clearance. We manufacture and supply the optimum quality of Radial Pole Round Permanent Electromagnetic Chucks. Ideal for grinding purposes, the offered radial pole round permanent electromagnetic chucks are known for their compact design and easy operation. Besides this, the offered radial pole round permanent electromagnetic chucks are known for high performance. Drastically reduces set up Time by using magnets. 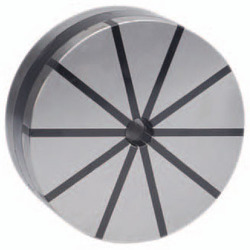 Our organization has earned immense reputation in offering Cross Pole Rectangular Magnetic Chucks to our customers at most affordable price range. Cross Pole Rectangular Magnetic Chucks are available in comprehensive range to our clients. 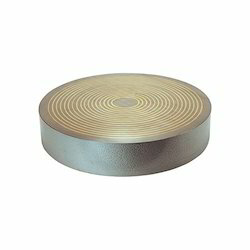 Provided product is mainly used for surface grinding. We are the most prominent market leader in magnet used for surface grinding. Looking for Magnetic Chuck For Grinding ?